WVHS Social Studies teacher, Ms. Holly Marcolina, recently received a “Bus on Us” grant to fund student visits to two historic locations in Hyde Park, NY. 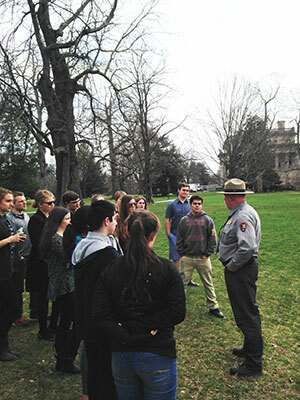 On March 31, Ms. Marcolina and members of the HS Youth in Government club, along with selected 11th grade US History/9th grade Global Studies Honors students, traveled to Hyde Park. The day began with a visit to the FDR Museum and Archives where students, under the supervision of a National Archives employee, explored primary sources from the Dust Bowl and Great Depression, and investigated key speeches, telegrams and other documents related to World War II. They then toured FDR’s beloved “Home on the Hudson” in Hyde Park, and a tour of the impressive Vanderbilt Mansion ended the day. The entire trip was made possible by a “Bus on Us” grant from the Teaching the Hudson Valley Foundation. To view a photo album, visit the District’s public Facebook page. You can view this photo album even if you don’t have a Facebook account.